Rickety Cricket Video Slot Guide & Review - Casino Answers! 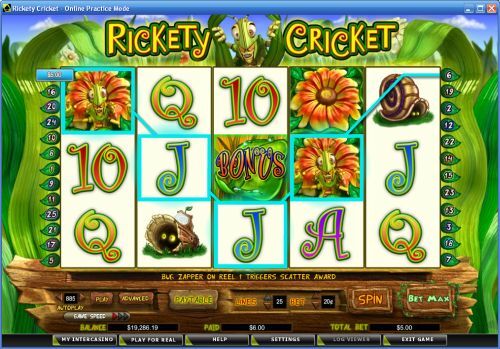 Rickety Cricket is a 5-reel, 25-line video slot developed by Cryptologic, featuring stacked wild symbols, scatter wins, multipliers and a free spins feature. You can play the Rickety Cricket video slot at [Americans: Unfortunately due to legal restrictions you are unable to play at any of the online casinos this game is at. We recommend you trying playing the unique slots at Win A Day Casino instead.]. Bets on the Rickety Cricket slot machine are $0.01, $0.02, $0.03, $0.04, $0.05, $0.10, $0.15, $0.20, $0.25, $0.50, $0.75, $1, $2, $3 and $4 per line. You can select from 1-25 paylines. Rickety Cricket is a penny slot, so you can play as little as one cent per spin up to the maximum total bet of $100 per spin. Rickety Cricket has a good betting range that will suit both casual players and high rollers. You can set the game speed at Normal, Fast or Very Fast. To play the Rickety Cricket slot game, select your bet and hit the “Spin” button or hit the “Bet Max” button to activate all 25 lines. 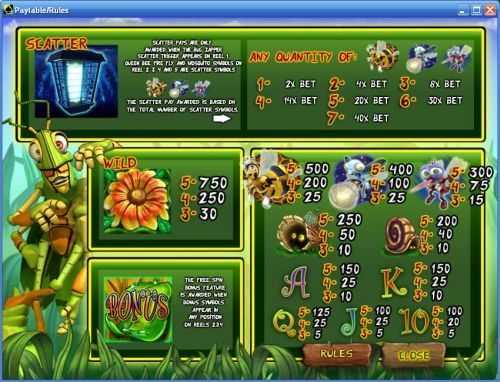 The highest paying symbol on the Rickety Cricket online slot is the Flower symbol. 5 Flower symbols will pay out the 750 coin top jackpot. The Flower symbol is a stacked wild symbol, so it can cover as much as an entire reel and substitute for all symbols except for the scatter and bonus symbols. The next highest paying symbols on Rickety Cricket are Queen Bee (500 coins), Fire Fly (400 coins) and Mosquito (300 coins). Scatter wins on Rickety Cricket are only awarded when the Bug Zappper scatter trigger appears on reel 1. The Queen Bee, Fire Fly and Mosquito symbols on reels 2, 3, 4 and 5 will pay out as scatter symbols. Scatter payouts of any quantity of those 3 symbols will pay as follows (scatter payouts in parenthesis): 1 symbol (2X), 2 symbols (4X), 3 symbols (8X), 4 symbols (14X), 5 symbols (20X), 6 symbols (30X) and 7 symbols (40X). When Bonus symbols appear on any position on reels 2, 3 and 4, you will activate the free spins feature. You will win 8 free spins with a random multiplier for each spin. You can get a multiplier of 2X, 3X, 4X, 5X or 8X. The free spins feature can be re-triggered, and an additional 8 free spins will be awarded up to a maximum of 98 free spins. If you trigger this free spins bonus feature, you can win a lot of cash at [Americans: Unfortunately due to legal restrictions you are unable to play at any of the online casinos this game is at. We recommend you trying playing the unique slots at Win A Day Casino instead.]! You can select up to 999 autoplay spins on the Rickety Cricket slot game. You can hit the “Advanced” button to set the advanced settings, such as cumulative win/loss of up to $5,000 or a single win of up to $5,000. You can stop the autoplay mode on Rickety Cricket at any time. Rickety Cricket’s highlight is its free spins feature, where your winnings can be multiplied by up to 8X. Other than that, the scatter payout system is interesting enough. The regular payline payouts are not anything special. You can play the Rickety Cricket online slot game by signing up and depositing at [Americans: Unfortunately due to legal restrictions you are unable to play at any of the online casinos this game is at. We recommend you trying playing the unique slots at Win A Day Casino instead.]. Can USA players play the Rickety Cricket slot machine for real money? Unfortunately, USA players cannot play the Rickety Cricket video slot for real money at this time. If you’re looking for a tremendous selection of USA-friendly slot games, we recommend you visit Bovada Casino or read our Bodog Casino Review. Can I play an Instant Play version of Rickety Cricket with no download required? Yes, you can play an Instant Play version of the Rickety Cricket video slot for real money at [Americans: Unfortunately due to legal restrictions you are unable to play at any of the online casinos this game is at. We recommend you trying playing the unique slots at Win A Day Casino instead.]. If you experience issues with the Flash software, make sure you have the newest version of Adobe Flash Player installed on your computer.